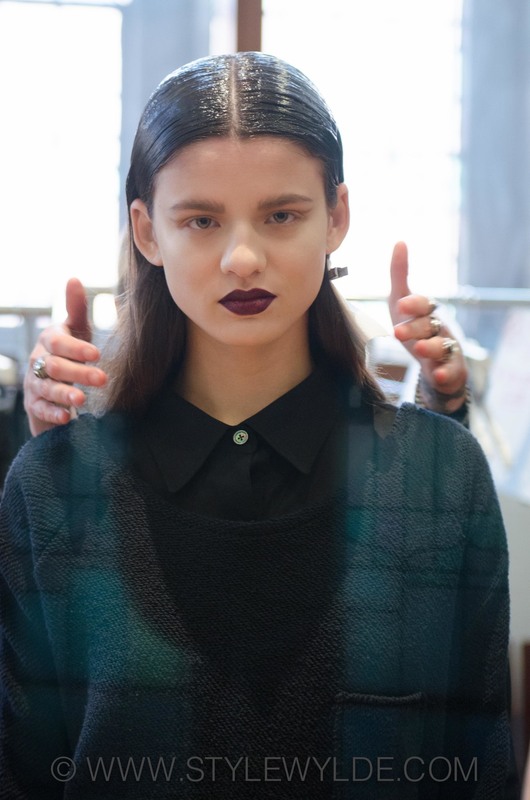 Designer Katie Gallagher has become very well known for her modern punk/goth meets futuristic point of view which was very present at the Fall 2014 runway collection. To create the perfect look to match Gallagher's dark looks, the designer tapped the best in the business. For hair, it was star stylist Nick Irwin, Global Creative Director Tigi Professional, and for beauty it was MAC's pro artist team. Here's what was done, starting with the hair. "The inspiration is this sort decaying, disused amusement park, but still young and very on point." Nick Irwin told Style Wylde backstage at the show. "It's really very punk, but not in a spiky hair way, but in attitude." First hair was prepped with a mist of water and combed through with a flat brush. Next hair was parted in the center vertically from the hairline to the nape of the neck. Next, additional parts were added horizontally to create smaller cross sections. Hair was then dried one cross section at a time moving upwards to create a smooth "molded to the head" finish. 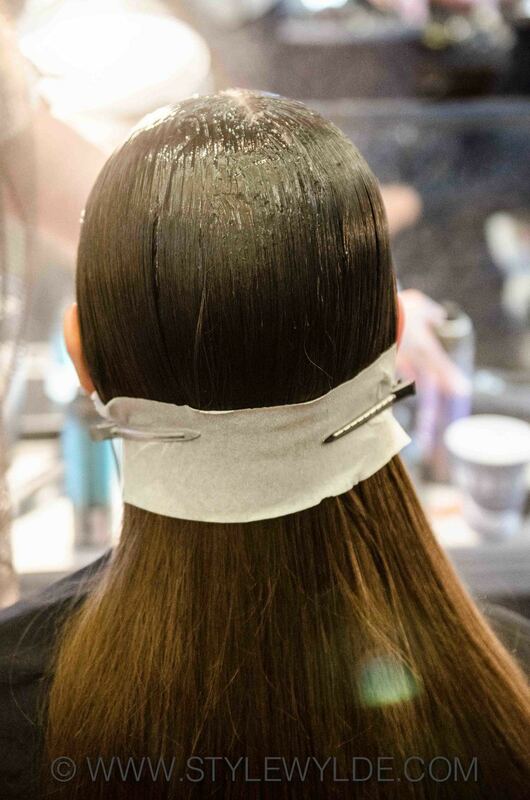 When hair was completely dry, Irwin and his team used a color brush to paint Catwalk by TIGI Session series Wet-Look Gel from the hairline to the nape, leaving the last 1/3 (approximately) of hair (down to ends) dry and natural for an appearance that transitions from wet to dry. Finally, all fly aways were smoothed with a fine toothed comb and set with ultra-vinyl like shine with Catwalk by Tigi Session Series Work It Hairspray. 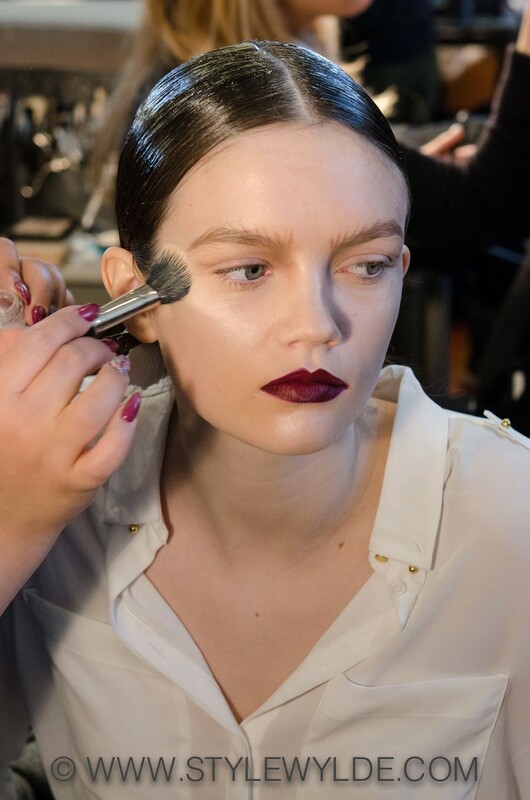 While all of this was going on, over on the MAC side, the professional artists were giving models a luminous, unearthly, almost watery glow via mega highlighting on the cheek bones and forehead, subtle eyelid contouring and a deep black-red lip.